Welcome back to the blog! 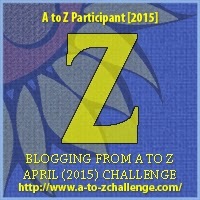 Can you believe this is the last day of the A to Z Blogging challenge? I can’t believe I made it! Today on the blog I’ve got Zrinka Jelic talking about zoology. Zoology, or animal biology, is the branch of biology that relates to the animal kingdom, including the structure, embryology, evolution, classification, habits, and distribution of all animals, both living and extinct, and how they interact with their ecosystems. All veterinary students are required to write a dissertation on this topic. But, today I’ll talk about creative writing and zoology. Those authors who write children’s stories and use animals for their character, whether they mingle with humans or all characters in the book are animals, and other authors who use animals in their writing, e.g. a paranormal shape shifters most popular werewolf. No matter what genre we are writing in, if we use animals in our stories, whether they assume animal shape at will, or are animals from the beginning to the end of the book, we need to describe them as such. From their movements, sounds, hunting habits, fur or scales or even feathers, these characters must be authentic to their species. Of course anything goes in paranormal, the werewolves can walk on their hind legs and half human-ish characteristics or once they shift into wolves they are wolves, who may still think as humans, but are unable to articulate their thoughts. That is why we study animal behaviour, maybe even pick up a few clues from our fur-babies. The way they greet you (or not) at the door: tails wagging, pink tongues lolling, loud panting and circling you, and let’s not forget sniffling to make sure you still smell like you. Or perhaps to check that you didn’t pick up smells from some other clan. So when writing about animals or as I like to call it in general, zoology, research is of essence. Years ago, unless you grew up on the farm or were a veterinarian, you wouldn’t know much about farm animals. Similarly, unless you go on a safari, you wouldn’t see a lion in its natural habitat. Thankfully, today information is at our fingertips and we can watch shows at our leisure from our own sofas and as often as we need to, to capture an animal’s character just right and pass those characteristics onto our heroes and heroines in the books. It’s fine to say that a wolf howled, but if that wolf is your main character, it’s important to know why wolves howl. Usually, to communicate with the wolves from the neighboring territories. Their howl can carry up to 50 kilometres. So if in your story wolves are used instead of human characters, but your animals act so but think and have human’s problems, the way they communicate across the distances must be true to their species. They can’t very well text each other. Well, that’s it from me on this topic. Hope it gave you a glimpse into much larger theme which is characterization. Only in zoology, we take an animal’s characteristics and apply them to our characters. 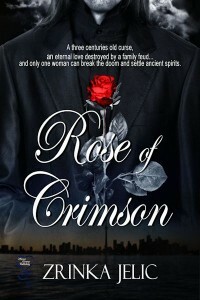 My 5th novel is titled Rose of Crimson and it was released by Secret Cravings Publishing on December 23rd, 2014. This is a prequel to Bonded by Crimson which was published on January 15th, 2012. I’ve started working on the prequel the day I was offered a publishing contract for Bonded by Crimson. Then it got pushed to the back burner while I worked on other projects. Since then I’ve written and published Treasured Chest, a pirate romance, Love Remains, a time travel romance and Deck the Halls, a Christmas novella. KATE ROKOV‘s grades are plummeting. She needs to get the voice out of her head or she will flunk her finals. MATTHIAS ZRIN, a three centuries old immortal, born into an aristocratic family as Miles Rušinić, is enthralled with Kate. It is his voice preventing Kate from sleeping and her ignorance is testing his limits. He wants her to write down his story to settle his wife’s earthbound spirit. His tragic love story has become Kate’s obsession since fifth grade during her summer trip to Rušinić castle. Their coming together settles the old spirit and breaks an ancient curse, and in doing so, a flame spanning over three centuries reignites and burns with wild desire. In this tale of two life times and desire versus emotional need, both know some dreams will have to wait for the right time, but the magic between them is impossible to withstand. Interesting topic. I want to start a shifter series and will think more in depth now about how they act in human and wolf form.